Choosing a paint color can make or break your home’s curb appeal. The right color can enhance your homes visual appeal, or a poor choice can negatively impact both your home and your neighbors home values. No one wants to hear “what were you thinking?” from the neighbors. Avoid the stress of painting your home the wrong color by following these 6 tips to get the best results. 1) All homes have permanent, hard or expensive to replace elements that you will need to coordinate with your chosen paint colors. Does your home have brick or stone accents? What color are your roof, pathways or fencing? The answers to these questions will direct your color choices. Take a closeup photo of each element and place them together alongside your paint swatch options to see how all the items look combined with the paint colors. While you won’t get a perfect color representation, this trick is a good place to start in narrowing down your options without spending any cash. 2) Do you have an HOA? If you do, your next step should be to check to see if there are any rules regarding paint color choices. Many HOA’s have pre-selected paint color combinations that are approved for use in your neighborhood. HOA’s may also have stiff fines or penalties for painting your home a color, not on the approved list. Nothing is worse than finishing your paint job only to get a notice from your HOA that you are in violation and need to repaint! So be sure to double check before lifting that brush. 3) Inspiration is everywhere. 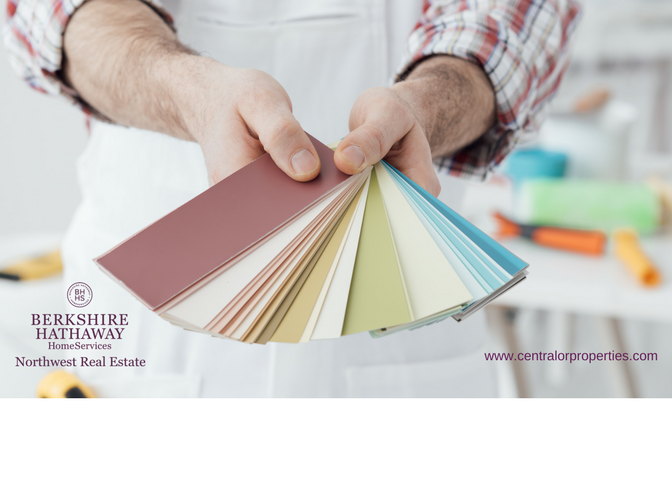 Start by looking at the homes in your neighborhood, is there a paint color scheme that you like? You can also look online for ideas or check out paint suppliers for color swatches or suggested color pairings. Keep in mind that with most homes you will need to choose at least 3 paint colors starting with the body of the home, accents (the doors, shutters, and small areas you want to highlight), and trim (railings, windows, eves & roof edging). 4) Consider your climate. Yes, climate does affect color choices. Light colored paints reflect light and darker colors absorb light, so it is easy to understand why a home in the desert would most likely be painted in a lighter tone, where a home in the pacific northwest would lean towards darker paint colors. It is also true that in certain climates paint colors can help reduce heating or cooling bills so make your choices with this tip in mind. Light colors are also a good choice to make a home stand out when surrounded by many trees. While a dark color pallet will stand out better in an open space or against snow in the winter. 5) Never buy paint without trying it out on your home first. Purchase a small test can of the colors you like and paint a swatch of each color on the wall next to each other. This is a very important step as paint colors do not always look the same in the can as they do on a piece of paper or on your computer monitor. Sunlight and shade can also affect how the color shows as well as the texture of the wall. You may need to adjust your color choice by going lighter or darker to compensate. 6) Some Architectural styles have historical color pallets. If you own a Mid Century Modern, Victorian, Craftsman or other Architecturally significant style homes you may want to stick to a color that reflects the time in which these homes were initially built. Even if your home is not old enough to be called historical, you can take your color pallet from the colors of that day and rest assured that are correct to the home type. Some cities have historical districts that may require specific color choices. If you own one of these homes, you can’t go wrong with the original colors from the period. You may also want to consult a color specialist, an Architect or the historical society for help.